Today we are going to continue our tour of Jen’s house by moseying on in to the bedrooms and bathroom which are all through a little hallway off the dining room. Can I just say, I am a sucker for a vintage built in with all of its original hardware. Seriously, how fab are these? The laundry shoot was an amazing invention. I suppose having laundry facilities on an upper floor is an even more amazing invention, but I wouldn’t know from personal experience! The grey on her walls here, by the way, is Sherwin Williams’ Light French Gray. There are two bedrooms with a bathroom in the middle. 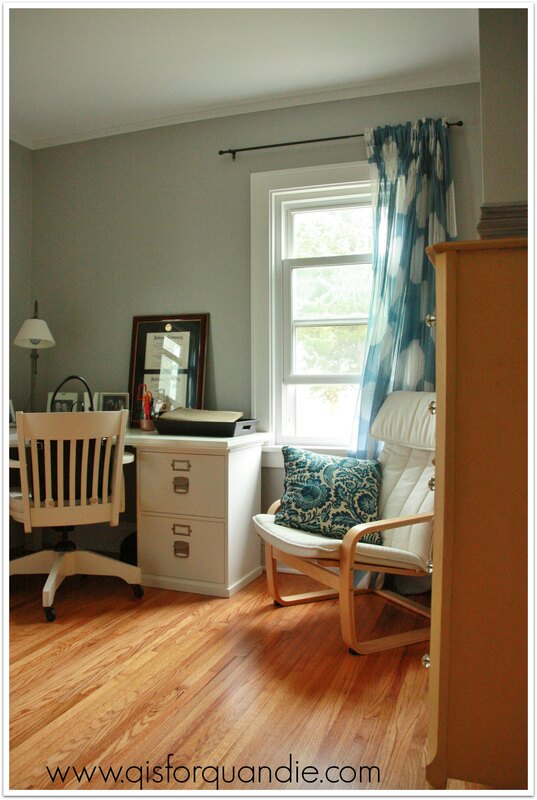 Let’s head into Jen’s study first, which also happens to be where she placed the dresser she purchased from me! Aren’t her floors simply gorgeous? I’m totally envious of their pristine condition. She did have them all re-done before she moved in. Smart move! Jen was asking my advice on how to style this room. 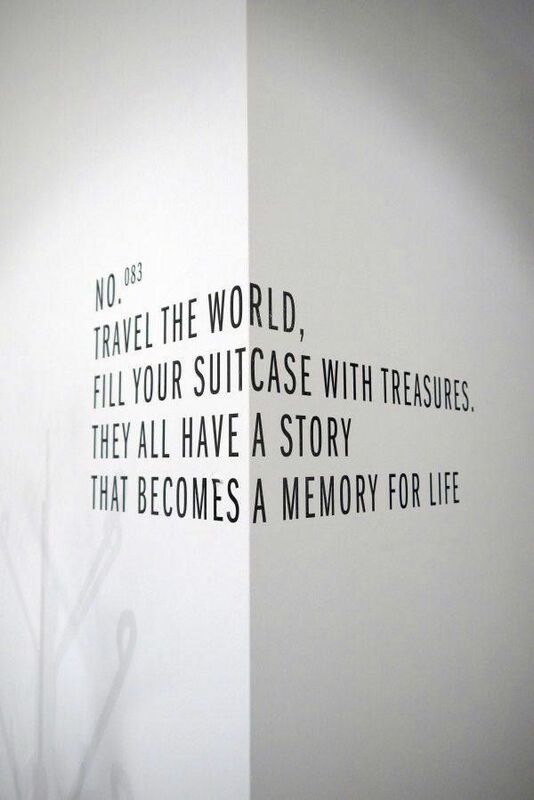 I like the idea of a wall quote, like this example from pinterest. This would work really well around the corner of the wall next to the yellow dresser. I also think one of those vintage pull down schoolhouse maps would look great on the wall over the desk, don’t you agree? If it had some yellow in it, that would help pull that color over to the opposite side of the room. Jen’s bathroom has gotten a little makeover with paint. She painted the walls and the base of the vanity. I know that down the road she’d like to make some more significant improvements in here, but like her kitchen, it is spruced up and presentable as is. I am always a little sad when it is obvious that the original sink has been changed out for one of these. 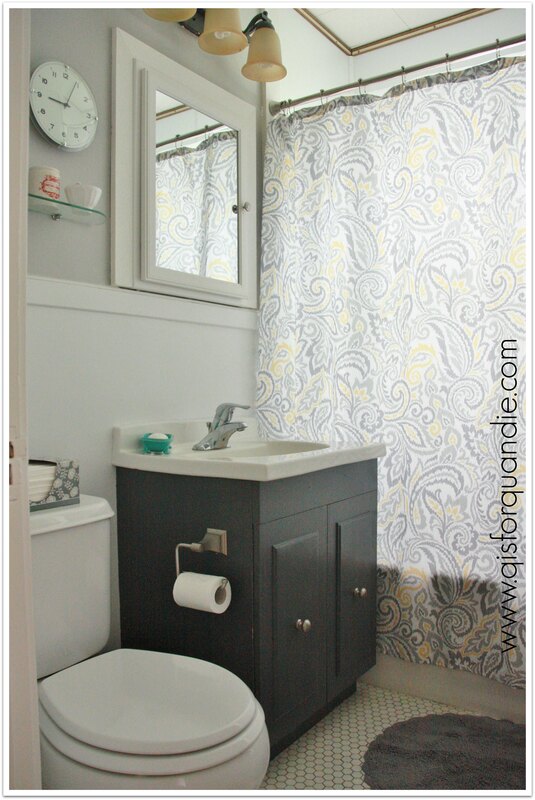 I had this style vanity in my own house when I moved in rather than the original sink. One day I would love to find a vintage sink that would work in my bathroom. Jen is lucky to have what appear to be the original floor tiles though, aren’t they fab? 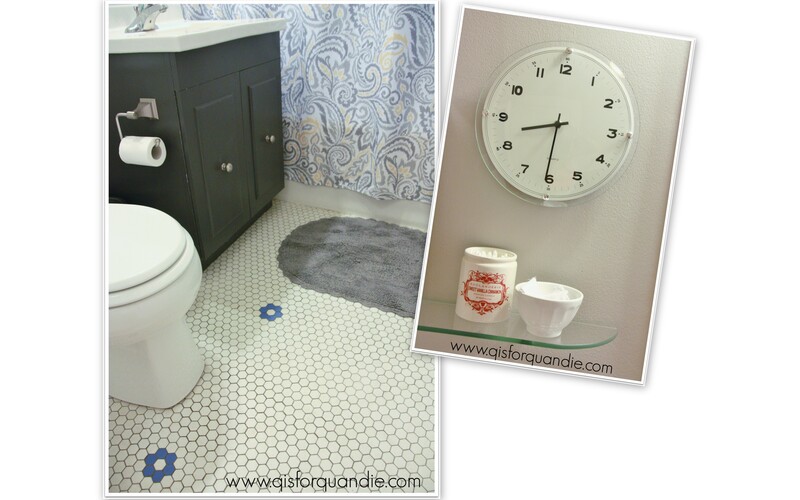 Those blue ‘flowers’ made from the hexagon tiles are simply smashing. Finally we come to the master bedroom. 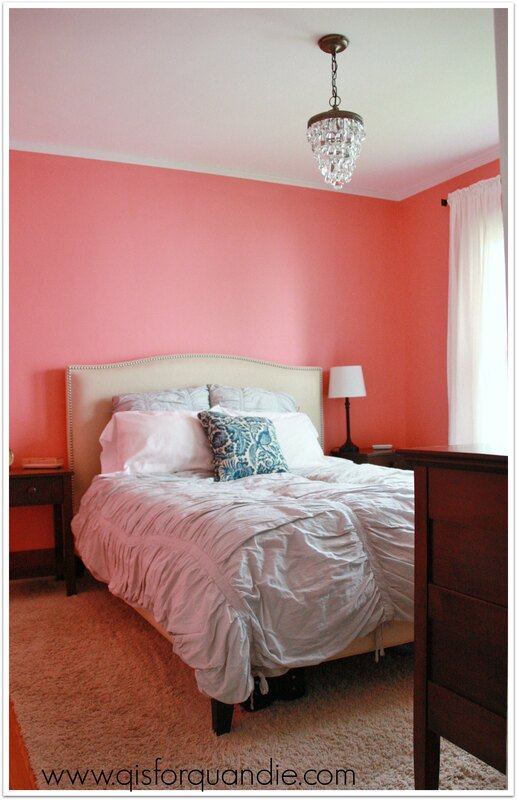 I absolutely adore the color that Jen picked for her walls, Coral Gables by Benjamin Moore. Isn’t it gorgeous? A lot of us would be afraid of using this much color on the walls, but it works beautifully here paired with the more neutral tones in her upholstered headboard and her pale grey duvet cover. The first time I was in Jen’s house the sun was out and this room just glowed with cheery coral goodness. I am very tempted to borrow this color myself. It would be perfect in my study, or my guest room. And the light fixture is amazing. Jen added this herself. I was surprised because it looked vintage to me. It’s perfect for above her bed. 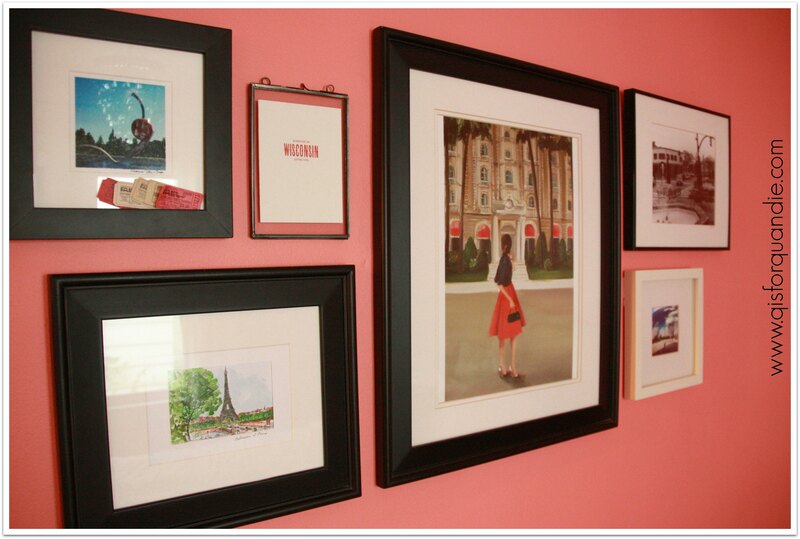 And here is Jen’s gallery wall, which also pays homage to places she’s been. I bet Jen will be adding to this wall over time with more pictures of fabulous places! I hope you enjoyed your tour of Jen’s home and will join me in thanking her for letting us all have a peek inside. I enjoy seeing what other people are doing with their spaces, especially those with an extra dose of character thrown in and I bet you do too! Thanks so much Jen! I hope you’ll stay in touch and keep us updated on your future projects. Love, Love, Love Jen’s house! What a fun house to work with and her style is perfect! Thanks for sharing. I am totally into the built ins darling home. Thanks Linda and Jennifer for the tour! I think the built-ins that you have designed do a great job of replicating the look of these vintage originals! At least the ones you’ve sent me pictures of do. Thank you! Older homes like yours and Jenna’s have so much charm and character. I am trying to recapture a bit. Jennifer has amazing decorating flair! Love the art pieces, esp the one with the MN shapes. Is that Jennifer in the photo wearing the vintage outfit? Very Audrey Hepburnesque. 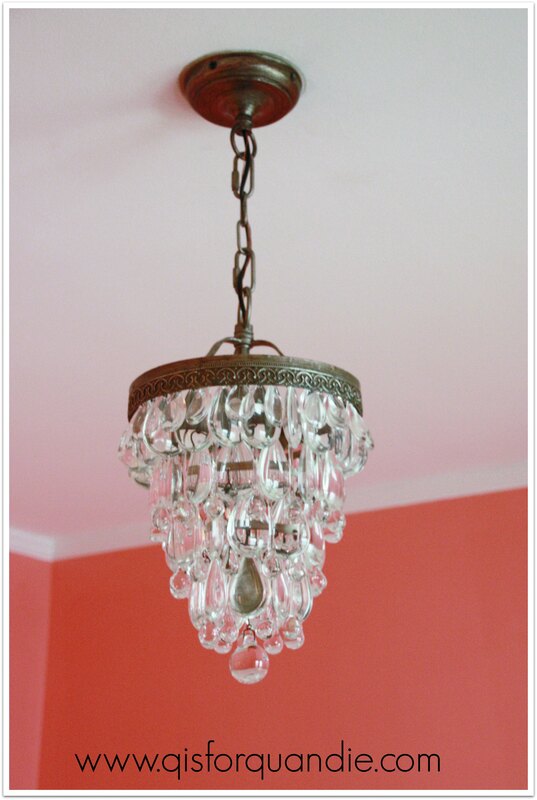 Beautiful light fixture in the bedroom, floors, painted woodwork, pops of color! Thanks for letting us visit! That isn’t Jen in the picture, but it could be! It looks a lot like her. That picture in my bedroom is actually a print of a painting that I purchased from an artist on Etsy. I also have a print of hers in my bathroom. Absolutely love the style! Here is her shop on Etsy…. I have the same IKEA chair! And the dresser looks fabulous next to it. Jennifer’s choice of color in her bedroom is spot on! In fact, she has inspired me to change my color to the coral in my spare bedroom. Her chandelier is stupendous, I wonder where she got it? Thanks for the tour of Jennifer’s beautiful space!! The chandelier is from Pottery Barn. It’s the Clarissa Glass Drop Small Round Chandelier. I LOVE it! I like this idea of the quote moving around the corner; it is sculptural art. 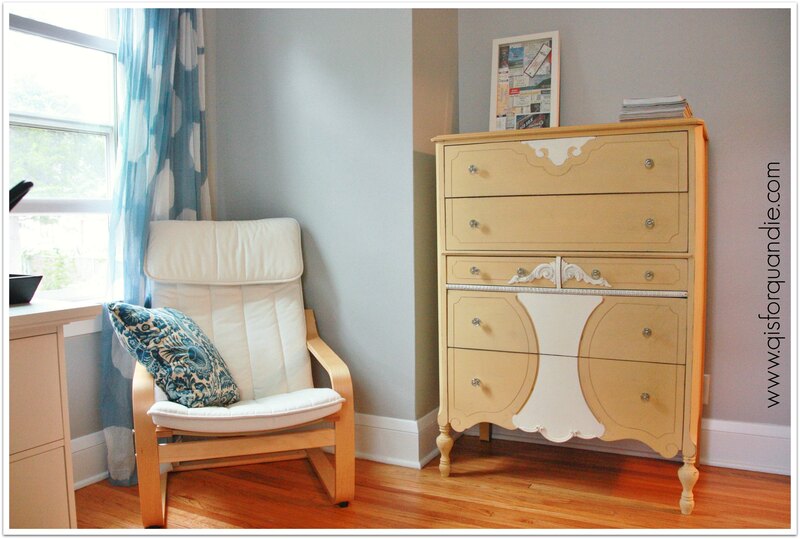 I also like the modern lines of the chair mixed with the 1920’s yellow dresser. It all melts together by use of complimentary colors. The coral walls of the bedroom with the crisp white curtains is great! Yeah I meant to mention the quote around the corner idea is a fabulous idea just love! 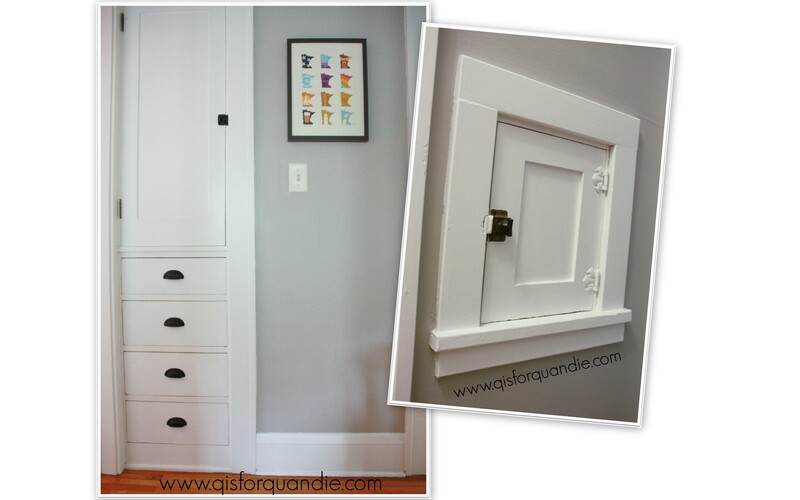 Love the built ins……perfect paint job and beautiful hardware! And the bedroom light! Can we all have one of these please? And…..the dresser! Is just the white painted or is the yellow paint also? Couldn’t tell on my computer, it’s absolutely gorgeous! Thanks for sharing all!!! The yellow is painted too, MMS milk paint in Mustard Seed Yellow. Here is the post on the dresser.